Tapovan is a high altitude alpine meadow. A wonderful place to camp and spend the night. You could see Blue sheeps also called Bharal in Tapovan. 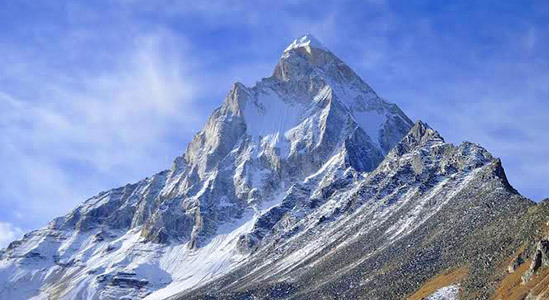 Mt Shivling can be seen radiating its glory. You will be staying in a geust house at Gangotri. Accommodation on all other days will be in tents (2-3 per tent). Gaumukh is the entrance of the ice capped spring of the Ganges, and Tapovan boasts for the mighty peaks of the Garhwal. 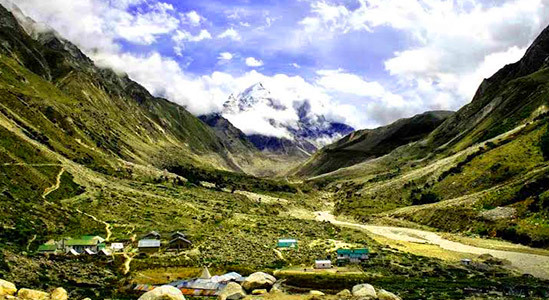 The Gangotri Tapovan trekking is made for all adventure freaksto give them a chance to get into Mountain Climbing, Rock Climbing, and glacier traverse. The Gangotri trekking visits bring an incredible chance to get to know the giant Himalayas and to feel the essence of the Indian culture. At Gaumukh, one can locate the powerful Ganges spouting out of a nose like opening. The spectacular view is without a doubt being worshipped by all (both adventure and nature lovers). When you roam through Gangotri to Tapovan, each turn in the trail uncovers another shocking magnificence of snow clad Himalayan monster. The excellence of Tapovan is something which is simply out of line unimportant to clarify in words yet without encountering it. Surging high glades, a system of murmuring streams and the nearness of some prestigious Himalayan pinnacles extremely beside you, make a standout amongst the most amazing sights in the area. Trekking can be a fun at the base of the Shivling top at an elevation of 6543m. Gaumukh, the wellspring of the River Ganga, itself is a reason enough to do this trek. Gaumukh is a sight without anyone else. Just when you draw near to it you’d come to know how enormous and radiant the ice sheet is! Every time you visit, there is something new to reclaim. You’ll reach your destination at Dehradun at dawn. Beginning your journey to the altitudes of Gangotri will take less or more 10-12 hours for sure. Although it’ll be a tiring ride yet will be relishing and full of wonders where you’ll explore the glimpse of numerous places such as Uttarkashi, Mussorie while you head toward the place.With breaking dawn, greet yourself with tea coupled with the snacks, since it’s going to be the most pious day of the trip at an altitude of 10171 ft. and it’s time to adapt your body with the changing climate and other things of the heights. Brace yourself, today’s going to be a real thrill, beginning with the Gangotri, we will trek to the Chirbasa, alongside of river Bhagirathi and an astounding Sudarshan Parbat which will accompany you throughout the trek. Following to which you’ll be having the glimpse of Bhagirathi sister peaks coupled with the bliss of beautiful pine trees. The trek will end in 5hours following to which you would be served the lunch and thereafter enjoy the evening alongside of Bhagirathi river. Relish the amazing trek to Bhojbasa from the Chirbasa where you’ll be able to explore the scenic beauty of the nature during the trek and a proximity to the Bhagirathi peaks as you trail towards the ascend. The trek ends at the plain terrain, the Bhojbasa. Enjoy your meal of the noon at campsite and capture the beauty of untouched nature. Get your belly full and bottles with water since it’s going to be the longest day of the trek as you’ll trek more or less than 9 hours approximately, viewing the most scintillating beauty of Gaumukh and the Tapovan which is known for the meditation of sadhu. You’ll find a mixed experience during the trek since the trek is fairly easy at beginning and get steeper and rocky as you proceed to Tapovan. Famously known as the spot of meditation and the abode of heavenly Gods, Tapovan serves you with the serenity of the nature accompanied with the natural vibes where you can explore your inner self with meditation or in the aura it transcends into you. A place to collect memories and experiences like never before. It’s the day when you’ll begin to retrace your own steps through the trails, packing the memories in your SD cards and minds respectively. While you descend you’ll realize that ascending is relatively easier than descending and risky as well. Enjoy the glimpse of Mt. Shivling while you descend towards Tapovan alongside the river Bhagirathi. To add up your surprise in the lap of nature, you’ll find the camp in the most aesthetic place you can ever imagine to spend a night. With the day coming to an end you’ll begin to feel lost and disheartened since the trek has come to an end. Soon you’ll realize the nature has its comfort zone in its adversities.The final trek to Gangotri will last up to 5 hours following a mouthwatering lunch in the proximity of river Bhagirathi and gigantic peaks. You’ll be hitting the Dehradun at the dusk or post that after which you are free to plan your ways to your respective destinations. The trek expense of Rs. 12,499 + 5% GST takes care of all expenses of the trek from Gangotri to Gangotri. Trekking Equipment – You will stay in high-quality tents and sleeping bags in all the camps. Our high-altitude sleeping bags can withstand temperatures as low as -10 ºC. We provide ice axes, roped, microspikes, gaiters etc. as required. Backpack offloading charges - If you wish to offload your backpack, there will be an additional charge of Rs. 2,100 + 5% GST. The backpack cannot weigh more than 9 kgs. Suitcases/strollers/duffel bags will not be allowed. Please note that charges will vary for last minute offloading in case you decide to offload your bag after reaching the basecamp (Rs. 2400 + 5% GST). Online offloading in advance is possible up to two days prior to the trek start date. Buffer day – It is mandatory to have this extra day as any bad weather or rain will delay your pass crossing. If buffer day is utilized, you will need to pay Rs. 1,790 + 5% GST. This amount is to be handed over to your trek leader. 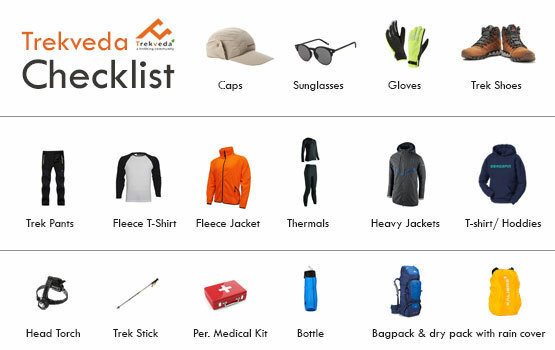 Or if you wish to call off the trek voluntarily at the last moment, in this case the mail requests at cancel@trekveda.comor contact at +91 7078701964 will be entertained.